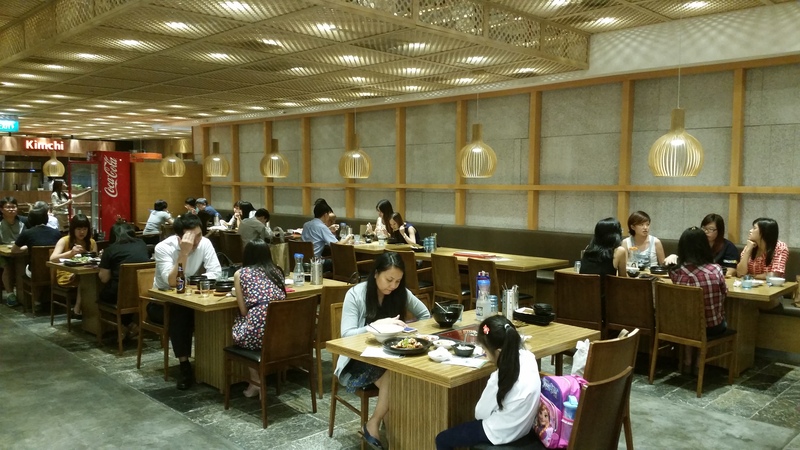 i often lament the fact that singapore has a lack of good and reasonably-priced korean food, so was rather excited to try out this relatively new joint that opened earlier this year after hearing good things about it! i’m glad to report that it did not disappoint, and i’ll definitely return when craving some korean kimchi goodness. 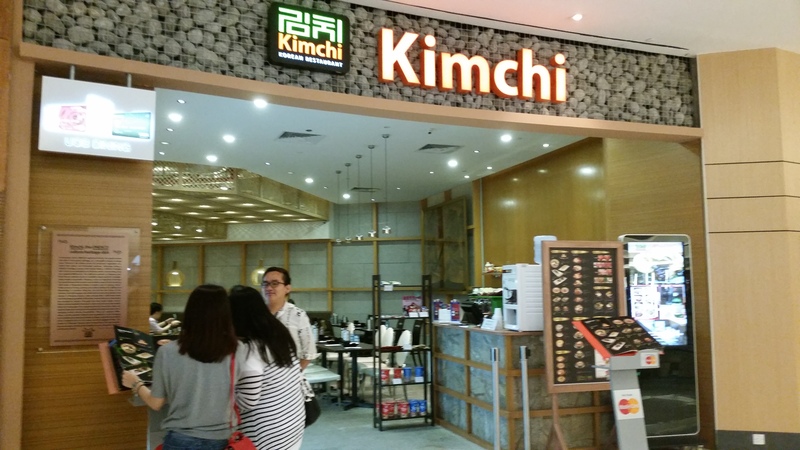 kimchi korean restaurant occupies a nice and spacious shop unit on the 2nd floor of suntec city. i was initially worried that i’d get lost in the maze of shops in sprawling suntec, but i entered on the revamped side that’s at the doorstep of esplanade mrt (i think its the side known as the convention mall) and finding it was a breeze. we arrived just before 7pm on a thursday night and the restaurant had several available tables when we arrived, but filled up really quickly soon after and was nearly full by the time we left. the dining area is very pleasant – tables are big and well-spaced out, good for both meet-ups in groups and cosy meals for two where you can talk about anything in the world without worry that the guests at the next table are eavesdropping. 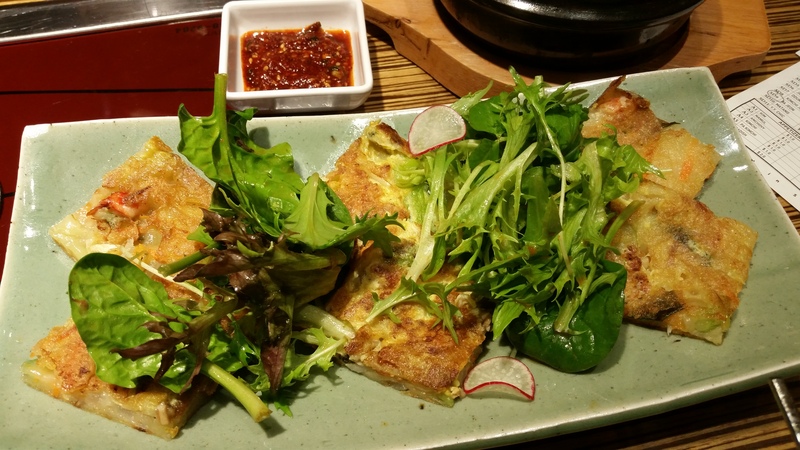 as for the food, the restaurant prides itself on having 100% of its food prepared by korean chefs, and a head chef who has worked in top 5-star hotels and establishments in korea. i do think their experience showed in the food that was served to us that day and the best part is that the food is not only good but also reasonably priced! 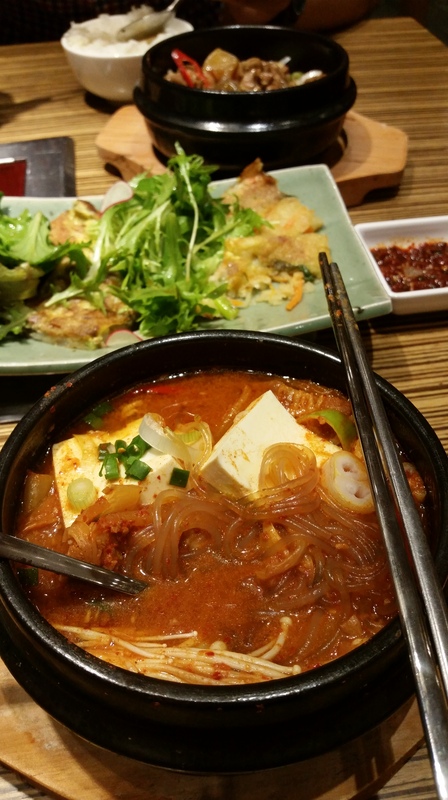 as you can see from the menu, they have a good range of korean staples – from barbequed meats to rice bowls to stews to soups to bulgogi – , and all are reasonably priced. the soup comes with rice but i asked to change the rice to glass noodles instead, and they very gladly obliged. 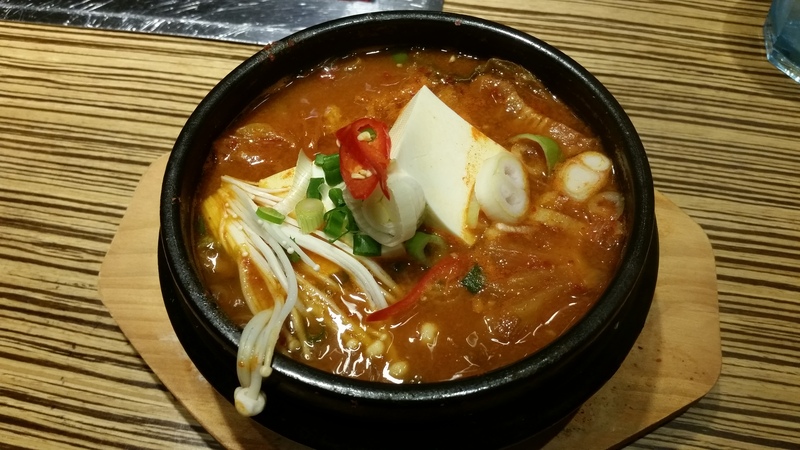 this was a great rendition of kimchi soup – it was flavourful and really packed a good punch (without being tear-inducing spicy), ingredients were added generously, and the soup was of just the right thickness (far from being diluted). the boy who normally detests kimchi (aversion-to-supposedly-sour-things alert) actually didn’t mind this and said it tasted different (in a good way) from the other kimchi soups he’s had and given his stamp of disapproval. i love kimchi soup/stew with glass noodles so was super pleased with this and happily slurped up them oodles of slippery springy noodles. good stuff. 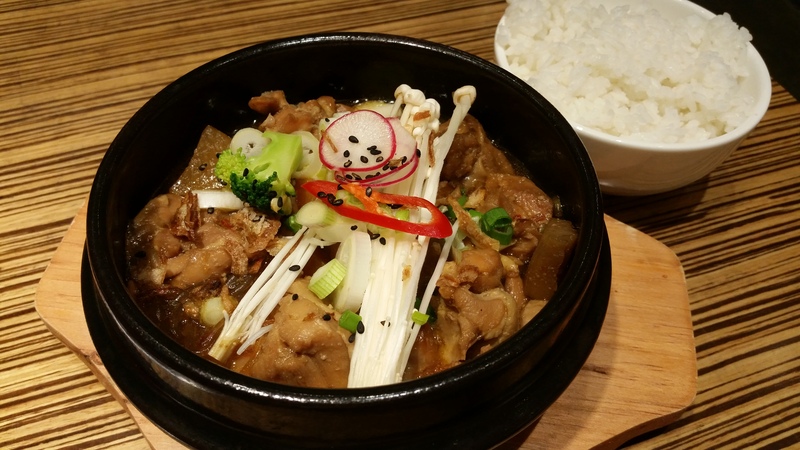 andong jjimdak is a stew-like steamed chicken dish that made us feel like we were having a lovingly homecooked meal. tender and well-seasoned pieces of chicken were served in a pot together with a myriad of root vegetables (carrots, radish, lotus roots etc) and glass noodles, and doused in just the right amount of some kind of soy-based spicy sauce. the chicken was naturally sweet and the sauce was fragrant. inspired by the chef’s own family recipe, this dish exuded a homely vibe yet was refined and light in taste. wasn’t too blown away by it at the start but the yummy mix of flavours grew on me as we progressed through the bowl. besides being a restaurant, they also have a small section at the entrance of the shop selling a range of korean goodies including drinks, snacks, noodles for cooking and fresh produce. we left really satisfied with the meal and without burning any holes in our pockets. this place will definitely come to mind when i’m thinking of somewhere to have korean food from now on, and i intend to return to try the barbequed meats sometime soon!